Gordon Novelty moved into this space on Broadway in 1934. The shop sold toys, games, party supplies, costumes, theatrical accessories, etc., and remained here until quite recently (2002). Prior to 1934 the business had been located on East 18th St. (1928) and at 125-127 5th Ave. (1929-34). The founder was Jacob (called Jack) Gordon (1907-? ), an immigrant from Russia as an infant. Jacob Gordon was also in business with his brother Samuel Gordon (1902-1986) as the United Balloon Co. In November 2002 this sign looked like this. The clown is no more! (Actually, as of March 2004 another head of the clown still looked out behind locked gates proclaiming Masters of Merriment). For another Gordon window from 1988 click here. Around 1997/98 Mark Gordon, grandson of the founder, changed the name of Gordon Novelty to M. Gordon Novelty. In April 2003 M. Gordon Novelty had a sign on the door saying they had moved to 52 W. 29th St. 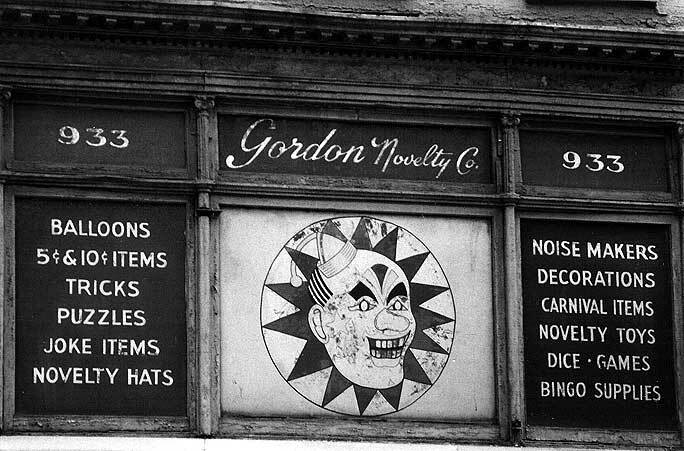 There is currently (May 2003) an M. Gordon Novelty Inc. located at 115 E 34th St. who are the successors to Gordon Novelty of 931-33 Broadway. Their telephone number 254-8616 dates back to the original Gordon Novelty at 18 E. 18th St. when the number was ALGonquin-8616.